From its inception, the Buddy Poppy Program has helped the VFW live up to its motto, “to honor the dead by helping the living.” The Buddy Poppy – small red flower symbolic of the bloodshed in World War I by millions of Allied soldiers in defense of freedom – was originally sold to provide relief for the people of war devastated France. Later, its sale directly benefited thousands of disabled and down-and-out American veterans. The poppy program was quickly embraced by the people of France, and also secured the sponsorship of the Prince of Wales, the Governors General of Canada, Australia, and New Zealand, and the President of Cuba. In each of these countries, veteran’s organizations and their auxiliaries agreed to sell memorial poppies for the benefit of the children of France. When the Poppy Lady turned to the VFW for help, the organization readily agreed to take over from the American Legion. In May 1922, the VFW conducted the first nationwide distribution of poppies in the United States. Then, at its National Encampment in Seattle in August 1922, the organization adopted the poppy as the official memorial flower of the VFW. Following the success of the VFW’s first poppy sale, the American Legion had second thoughts about its withdrawal from the program. A disgruntled American Legion was not the only problem to plague the VFW’s poppy program in the early years. The American and French Children’s League (Sometimes referred to as the Franco-American Children’s League) had been dissolved shortly before the VFW’s 1922 poppy sale. Much of the poppy supply went with it. Consequently, the VFW had great difficulty obtaining enough poppies for the 1923 sale. In February 1924, the VFW registered the name “Buddy Poppy” with the U.S. Patent Office. On May 20, 1924, a certificate was issued granting the VFW, under the classification of artificial flowers, all trademark rights to the name of “Buddy.” No other organization, firm, or individual can use the name “Buddy Poppy.” The VFW has made this trademark a guarantee that all poppies bearing that name and the VFW label are the work of bonafide disabled and needy veterans. After the 1924 sale, some of the larger state departments of the VFW suggested that it might improve local sales if the poppies used were made by hospitalized veterans from their own area. The delegates at the 1924 National Encampment agreed. They ruled that poppies would now be made throughout the U.S. by disabled veterans in government hospitals and by needy veterans in workshops supervised by the VFW. Currently the little red flowers of silk-like fabric are assembled in eleven different locations. The VA Facilities in which they are made are located in: Leavenworth and Topeka, Kansas; Biloxi, Mississippi; Temple, Texas; Martinsburg, West Virginia; Hampton,Virginia; Milwaukee, Wisconsin; Dayton, Ohio; and White City and Grand Rapids, Michigan. From the start of the VFW’s poppy program, the U.S.Veterans Bureau, the Administrator of Veterans Affairs,and other federal agencies have supported the Buddy Poppy. And beginning with Warren G. Harding, U.S. Presidents have also been staunch supporters of the program. Each year, a Poppy Girl or Poppy Boy selected from the National Home’s residents starts the annual campaign by presenting the first poppy to the President Of the United States. Today, there are strict rules governing how profits from Buddy Poppy sales are to be used at different levels within the organization. The National organization assesses a fee of three and one-half cents on every poppy sold to a state department. This fee is added tothe cost of manufacturing and distributing the poppy. Fee revenues are allotted as follows: one and one-half cents to the service fund of the department that purchased the poppy, one cent to the VFW National Home, and one cent to the Veterans Service fund of the National Headquarters. At the department level, an additional fee is normally added to the cost of the poppies it sells to the posts in its jurisdiction. This profit is used to fund department service work or other programs for the relief or well being of VFW members. Posts receive their profits from direct sale of the poppies to the public. For the aid, assistance, relief, and comfort of needy or disabled veterans or members of the Armed Forces and their dependents, and the widows and orphans of deceased veterans. For the maintenance and expansion of the VFW National Home and other facilities devoted exclusively to the benefit and welfare of the dependents, widows, and orphans of disabled, needy, or deceased veterans or members of the Armed Forces. For necessary expenses in providing entertainment, care, and assistance to hospitalized veterans or members of the Armed Forces. For veterans’ rehabilitation, welfare, and service work. 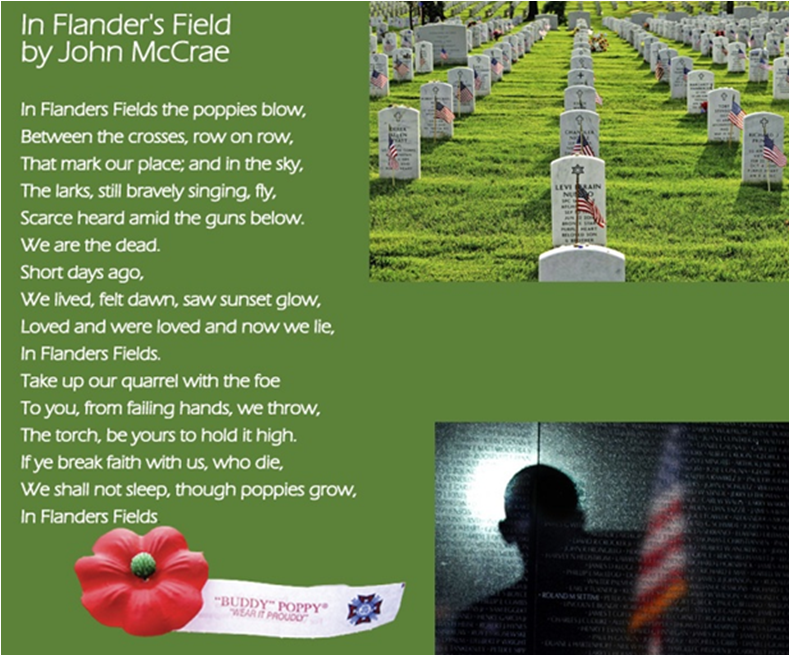 To perpetuate the memory of deceased veterans and members of the Armed Forces, and to comfort survivors. With help from the VFW, the “Little Red Flower”continues to benefit the needy just as the Poppy Lady believed it was capable of so many years ago. In 1989, for example, 17,894,684 poppies were sold for an average donation of 55 cents. To date, the VFW has sold over three quarters of a billion Buddy Poppies. As long as Americans continue to spill their blood in Defense of freedom, sales of these blood-red poppies will undoubtedly continue strong.